Vernon J. Kaspar, 95, of Frankfort Indiana died in his sleep at 2:47 Friday morning January 5, 2018, at Milner Community Healthcare, Rossville, Ind. Vern was born on January 15, 1922, in Sioux City, Iowa to Charles and Alma (Goering) Kaspar. He married Lillian Lundgren on September 2, 1944, and she preceded him in death August 20, 1999. Vern Kaspar graduated from Iowa State College in 1945 with degrees in Physics and Engineering. A veteran of World War II, he enlisted in the Navy and completed officer training school at Princeton and Columbia in 1945. In the early 50’s Vern Kaspar was in a management position at the only TV station in Iowa at the time, WOI Des Moines. By the late 50’s Vern and Lillian Kaspar purchased WILO AM 1570 at the age of 39. Kaspar Media now includes some 10 AM/FM/translator stations in Indiana and Missouri and other holdings. Vern and Lillian Kaspar traveled extensively with other members of the press and personally interviewed world leaders including Saudi King Abdula, Yasser Arafat, Bishop Tutu, Poland president Jaruzelski, King of Jordan, and Dwight D. Eisenhower. Vern Kaspar traveled behind the iron curtain before its fall and visited Cuba and editorialized to open up relations there before Clinton did the same. He broadcast on the radio from Havana, Cuba. He had many interests. Vern Kaspar visited 61 countries and enjoyed learning something each day. He enjoyed observing national and international politics and delivered hundreds of editorials on WILO, WSHW, KWRE and KFAV over the years. He was an advanced extra Amateur radio operator and able to send and receive Morse code in excess of 60 words per minute. 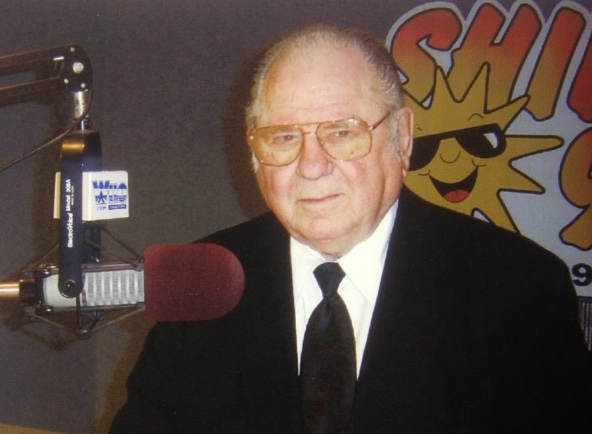 Vern Kaspar was inducted into the Indiana Broadcasters Hall of Fame in October 2004. He was a former board member of the National Broadcast Editorial Association. At the age of 13, he received his FCC License, and he is most likely holding the oldest FCC license in the United States of America. He was a 32 degree master mason and was widely known for his generosity. Family: 3 Sons: Victor (Karen) Kaspar of Dunn, NC, Steven (Pat) Kaspar of Warrenton, MO, Russ (Susan) Kaspar of Frankfort, IN, 10 Grandchildren, Dawn (Sam) Constance, Don Boisvert, Kelli Jo Kaspar (Bill) Shroyer, Justin (Kelly) Kaspar, Michael (Lindsey) Kaspar, David (Michele) Kaspar, Benjamin (Megan) Kaspar, Ryan (Fiancee Lafayette Deon Kelly) Kaspar, Alex Kaspar, Trevor Kaspar, 16 Great Grandchildren and 1 Great Great Grandchild. 4 Nieces also survive. Preceded in death by his parents, a brother, Raymond Kaspar, infant daughter, Susan Kaspar and granddaughter, Angela Kaspar. This piece is about Grandpa. I learned so much from him and wrote this a few months ago. What have I learned from Vern Kaspar, my paternal grandfather? From articles to books, he was always taking in something. He was a news junkie too and tried to always “be on top” of the news without ever having a tidbit escape him. As the internet grew in the 90s this resulted in voraciously trying to capture even more. Piles of articles and loads of books were all over his house, and there was a creative side too of something or a pile of them going at once. He would take them in to stir his own thinking, affirm what he was already thinking or to let it question his own. He asks questions of society and public figures. From his long-standing radio show which he started in 1960 called “The Party Line,” which continues to this day in 2017, he would usually bring questions and issues of the day to discussion. For many years he would offer a 5 minute editorial engaging some big question of local, craft it into a module and read it aloud on the radio station. This included local, national or global scope of issues. He interviewed senators, representatives, mayors, councilmen and even figures like King Hussain of Saudi Arabia, Vincent Fox, President of Mexico or Yasser Arafat. He sees it his duty to question and then share his findings with others. When I was in my teenage years, Grandpa urged me to learn to “touch type.” He went on and on saying how much it has saved him hours and hours and how he uses it every day. Now, I use it hours and hours and every day. Regarding other technology he was often the first one I saw using Kindle, internet, bluetooth and many other technologies before others. He could be labeled as an early adopter. He often tells the story of getting into HAM (amateur) radio in his early teenage years. This birthed his interest in radio which led to learning and using Morse Code in the South Pacific during WWII and then starting a radio station in 1953 in rural Indiana. His love for early adoption of technology opened doors for him. When the technology could connect another person, it fueled him even more. From phone calls with tech support for a product or service to a conversation with a family member or marriage, he worked hard to make sure no one assumed too much. Sometimes this turned friendships or close relationships into feeling more like a business transaction, but this was his perspective— try to over communicate. He is a worker. He got up thinking about work and went to bed thinking about it. For him, this was a driving force. I don’t believe it is money which drives, though a nice side benefit. It was probably the success. He just liked to succeed or win. As long as I can remember he was saving at least 10% of his income. I think many times it was even 20%. Usually this was more after things were paid off. He had an eye for quality and had the money in the bank saved up to afford the quality. I remember him having compassion for others in times of need if they asked him. He didn’t seem to tip amazingly well, but if people made a case to him or asked him boldly, he would listen to their reasons. At some point he contributed significant funds to get a community college going in the small rural and manufacturing town of Frankfort, Indiana. The building used for the Ivy Tech Campus in Frankfort was the former newspaper building. The local paper (The Times) may be considered one of the radio station’s competitors. That building is now named “Kaspar Hall”. There were others along the way who received from his generosity. For me, he helped me experience the following countries: Syria, Turkey, Mexico, Brazil, Argintina, Chile, and Peru. He helped contribute toward my university studies too. I’m thankful for his foresight to see and then invest in me and others. I believe he also started a STEM scholarship for the local high school. He was the first person to talk with me about mutual funds. He started some for me which continue to this day and helped launch me into some of my dreams like home ownership and buying a rental property among other things. One time he gave me a check and wrote me an accompanying letter with it. I think the letter was as much an investment in me as the finances. He saw his influence as significant contribution to others. He is a fighter. Though he does not use weapons, he tenaciously fights with weapons of words and influence. He takes up a cause and with tenacity and repetition, he wears the other down. He fights till he wins, and he likes to win. Grandpa engaged with other cultures. He loved being in other cultures and forming some sort of connection with the other person. From the everyday shop owners in a global city to the local Frankfort, Indiana, resident. He engaged with the cultures and people. As a young person I saw he and my grandmother every year take a couple trips overseas usually with the purpose of delighting in the other culture. He would come back with some editorial commentary for the radio station, WILO and WSHW, listeners. Grandpa had his stuff like radios, printers, computers, nice home, etc . . . but I saw him really come alive when he was engaging in experiences and people. He loves to influence others. Grandpa’s father didn’t believe in education. He said, “It was for fools.” Grandpa had a high school teacher who believe in him and encouraged him to go to college. This changes grandpa’s trajectory from one NOT encouraging education to going through it. When an employee would ask for a raise, he would say, are you sure you want to have this conversation? It will be an opportunity for me to look at your work and say based on your work, “This person needs a decrease, stay the same, or increase.” Are you sure we want to have this conversation? For over 50 years, this little slogan was on all the metered mail going from Kaspar Broadcasting. He spoke about it. This insight highlighted journalism for me. While other branches are important, the media is “watchdog” for all the branches. Grandpa liked music “you could sing and dance to.” Of course, for him, this brought him back to the 20s, 30s, and 40s. I remember sitting at the piano playing a song I had made up. He urged me to learn some music which people already had emotions for . . . make them crowd pleasers. As simple as this is, many people go through life without opinions. They don’t care. They don’t cause change or influence or make a difference. Grandpa, by his life, was a strong-willed person. We all have negative attributes. We all do. I’ll leave Grandpa’s for another day. In the big picture, from a grandson who has spent hundreds—maybe thousands—of hours with him, I’m deeply thankful for him investing in me and many others. Before WWII Vern had an F.C.C. Radio Telegraph License and worked for the West Virginia State Police. On duty Vern had immediate contact with all of the other 47 states in our union. Using CW he obtained vehicle registrations for the State Troopers when they stopped out of state vehicles. He operated from several world QTHs. Liked to use high towers and monoband antennas. Had 5 element mono @ 152’/51 meters on 20. A 2 element phased array @ 160’/53 meters on 40. A 12 element log peiodic at 35 meters. A 5 element 15 meter telrex @ 24 meters & 5 element 10 meter telrex @ 22 meters. Wire antennas include a Super Loop running North/South at 110 feet/31 meters. He also had a 160 meter Carolina Windom at the same height running East/West. Vern used a Tascam MD-301 MK II minidisc recorder and, if asked, would record your transmission and play it back for you. Vern optimized the dot weighting & CW waveform rise & fall time on his IC-7800 to facilitate his love of QRQ CW. Vern also built, owned, and operated 50,000 watt and 25,000 watt FM broadcast stations with 500-foot towers, as well as AM broadcast stations and translators in Indiana and Missouri — including the first 50,000 watt FM radio station in the U.S.A. to operate 24/7 IBOC/HD Radio (digital RF).